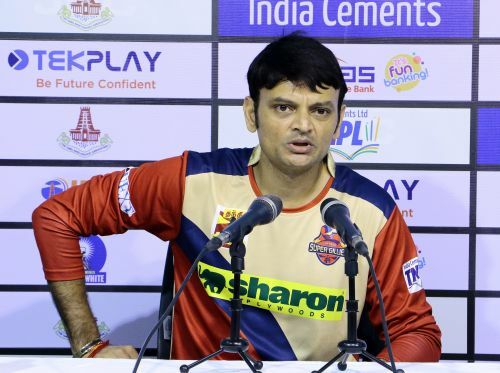 Chepauk Super Gillies coach Hemang Badani addressed the media after his side's loss to Albert TuTi Patriots in Qualifier 1 of the India Cements Ltd TNPL 2017 at the MA Chidambaram Stadium, Chennai. Do you think it is more of a mental battle than a physical battle against Albert Tuti Patriots? I think pretty much both the sides have been well equipped and have done well. If you look at last year and this year we both have been the top two sides. We have won six games and the only game we lost was against TuTi this year. So it’s pretty much a mental game at the moment and we’ll have to set that right. Was it a conscious decision to defend against Ganesh Moorthi and attack Athisayaraj Davidson? No. There wasn’t any strategy to see off Ganesh Moorthi. The strategy was just to watch the ball and play accordingly. Since he bowled well last year, we had decided to watch him. Why did you’ll opt to bat first today? It’s a big game and in a pressure game, it’s always good to have runs on the board. I thought that the wicket was a good surface to bat on; it’s just that we played some poor shots. I think if we had scored 130 or 140 runs the game would have been on. We lost wickets at regular intervals, didn’t have partnerships which we had in previous games which is why we got stuck at 115. If we had someone like S Karthik batting longer or Antony Dhas, the game was on. Do you think that you are over-reliant on your openers? I’ll correct you as you are mistaken there. Who has won us the last three games? Our middle-order! Antony Dhas and Sasidev have won us games, so I disagree with you. With 115 to defend, did you feel you could have done something different early on? We did bring in Sai (Kishore) in the second over itself and that was anyway the ploy to bring him in early. It might look like a few sixes went over square leg but they were not hit well and were top edges. If we could have gotten them early, the game would have been a lot better than this. Mind you Washington Sundar is batting very well. So let’s give credit to someone who is striking it well and hitting it in a different zone from any other player in the tournament. He is someone who will be a thorn in most teams’ sides. This is his fourth Man of the Match award which clearly tells you he is batting far better than anyone else. Does it feel good that you have two chances to make the final? It’s a tough game for us in the sense; TuTi have beaten us four times. We have a good record with every other side. We will regroup before the next game and try to play a good match at Tirunelveli. We will take it one game at a time. Do you think the reverse sweep can be taught in the nets? We don’t see the right arm batsmen using that shot often against the left-arm spinners. That’s a good question. The tournament has been ruled by a lot of left-arm spinners if you look at a lot of the matches. Ganesh Moorthi, Srinivasan, Sai Kishore, Alexander, Rahil Shah, Mohan Prasath, Suresh Babu – it’s been a tournament of left-arm spinners. If I was a right-hand batsman, that would be a shot that I would work on. The only problem with this now is that there is not enough time between matches to work on a shot or to try and master a shot within two to three days. The players should go back to the drawing board once the tournament is done and come back better prepared. I would hope some players prepared for it this year itself; keeping in mind last year was a tournament of left-arm spinners as well. I’m a little surprised that a lot of the younger players have not done their homework. Why do you think some teams have done better than others? I think the guys should learn how to handle pressure in the middle. A lot of them have not seen such huge crowds, attended press conferences, social media, etc. Let’s face the facts that these are guys who are just starting their career in the first division; they will learn in time. Look at the catching, it has been extremely poor from all the sides, it’s just about handling pressure. There are times in a game where things should go normally but they play a silly shot it’s just pure nerves. It’s not that they don’t have the skill but it’s just that they’re not used to playing under pressure. With anyone at this level, if they want to do better and go to the next level, it depends on how you handle yourself and your nerves.